It's been a couple of very wet days here and to make matters worse the little one has been under the weather. Nothing serious but she's been a bit clingy and not wanting to go outside as much as normal. 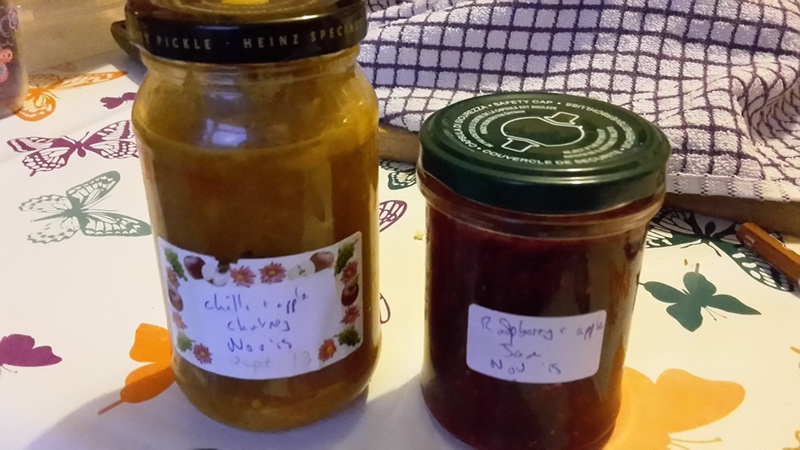 So while she's napped I've started to do a bit more preserving of this years harvest. The first thing I did was to make some jam, just 7 jars but it's a start. These was using some raspberries I'd picked earlier in the year and some of the left over cooking apples from canning the other day. Jam making is so simple and we eat much more of it than we used to! In fact we were down to just one jar left! See previous posts on raspberry jam here and here. 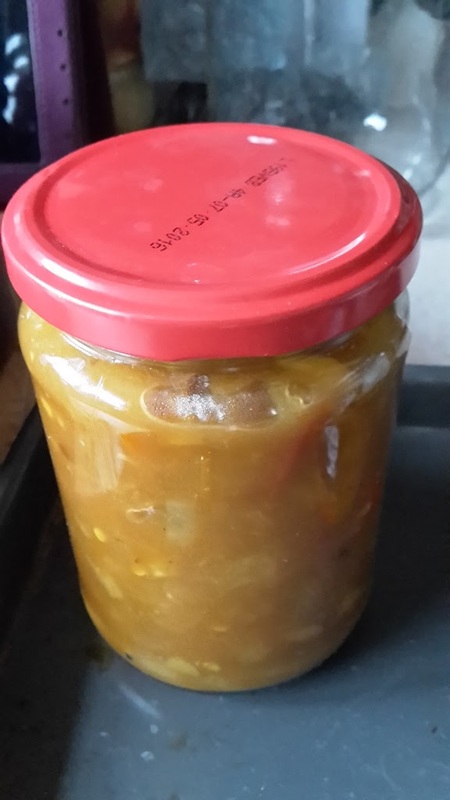 Then the next thing I made was some chilli and apple chutney. Although I froze a load of chillies I still had some on the plants that I didn't know what to do with and I fancied something spicy to make cheese sandwiches a bit more interesting over the winter. I need to let this mature for a month before I try it, so please don't copy the recipe yet but I'm going to write it here incase it's any good and then I'll be able to copy it at a later date. Chillies - I used a few Sotch Bonnet, half a dozen cayennes, one Aji Crystal (really hot), and about eight cherry bombs. Rasins - You can add these if you like but I hate them in chutney so never do! I then cooked the onions until soft, added the apples and garlic and did the same before adding everything else and cooking until I could see the bottom of the pan when I pulled the spoon through. Pour into sterilised jars and keep for a month before eating. I made five jars. when I tried a bit the hotness was a growing sensation! Not too hot but it builds over time. Really looking forward to trying this when it's matured! Anyone else made any chilli preserves lately? The chilli apple chutney sounds lovely, I'll have to give this a go :-) Hope your little one is feeling better soon. She's fine now, just a cold and a virus. I tested some chutney and it's not as hot as I was thinking it would be but still really nice. Mine have started to go mouldy so I thought I'd better do something with them. Thank you for a useful blog, here you can find all that is necessary for a real hostess. As a representative ща online custom essay writing service, I can say that you write as a true writer. With British Essay Writers, you never have to worry about slow delivery. As the name the name suggests, our website delivers exceptional dissertation constructed with precision. As a result of this, clients consider our website as one of the Cheap Dissertation Writing Services UK. So place an order now and test our quality yourself!